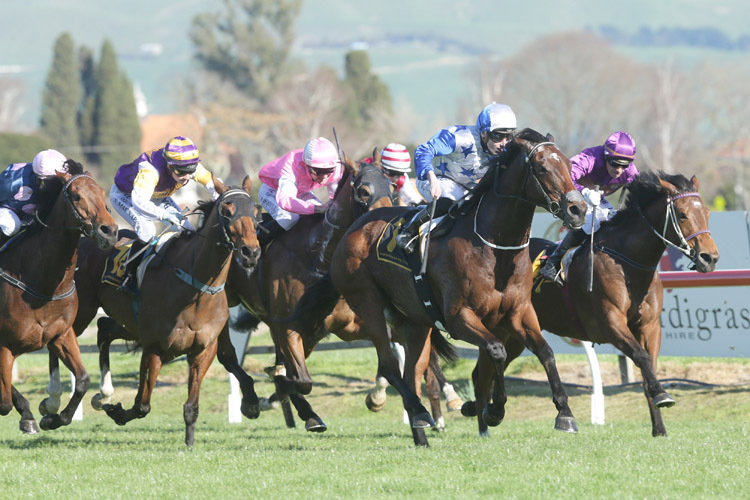 Recently crowned New Zealand Champion Stayer for 2017-18, Charles Road, showed he was ready for some big spring assignments when he downed a talented field over 1600m at Hastings on Saturday. The Gr.1 Sydney Cup (3200m) placegetter made an emphatic statement as he charged home carrying top-weight of 60.5kgs to down the free-going lightweight Big Mike at a distance well short of his best. The performance confirmed he is building nicely as his connections look to options that include the Gr.1 Livamol Classic (2040m) in October and possibly the Gr.1 Melbourne Cup (3200m) on the first Tuesday in November. Rider Sam Weatherley was emphatic in his assessment that the Myboycharlie five-year-old was ready to step up over the next few months. “He’s a very good horse,” he said. “For him to do what he has over a mile today means there are exciting times ahead once he gets up to two miles. Co-trainer Andrew Scott was pleased with the effort off the back of a tidy first-up performance in the Gr.2 Foxbridge Plate (1200m) at Te Rapa last month. “It was encouraging today to see he is coming up in the right manner,” he said. “It was a really good effort with all the weight as the leader had very little. Scott was unsure of just what the next opportunity would be for Charles Road as co-trainer Lance O’Sullivan and owner David Archer mull over their options. “We’ll just have to get home and have a chat to Lance and David,” he said. The victory was the sixth in a 21-start career to date for Charles Road who was a $90,000 purchase for Archer from the Wentwood Grange draft at the Premier session of the 2015 National Yearling Sale.